Our practice provides care for Headache & Migraine sufferers to the local Adelaide area as well as the surrounding suburbs of Medindie, Medindie Gardens, Walkerville and Prospect. Headaches appear as pain in the head, in or around the eyes or ears and behind the back of the head. There are many different types of headaches, and many different causes. The most common types of headache seen by North Adelaide Physiotherapists is a tension headache or cervicogenic headache. When treating a headache most people will reach for pain killers. Traditional headache pain relief typically comes from paracetamol, aspirin or ibuprofen. However, persistent headaches or chronic head pain may require an alternative treatment. Many people are turning to therapies or remedies that will complement, or even replace, conventional treatments for their headache. Physiotherapy is one such therapy that can help with headaches. What are the causes of headaches? Headaches are a complex type of pain and there is evidence that a high percentage of headaches are due to problems in the neck structure. Physiotherapy can help solve these problems and put a stop to the associated headaches. Headaches can be caused not only by dysfunction in the neck region but also by physical and emotional stress and tension. The physical aspect of the headache can be successfully treated by your physio and preventative advice can be given to stop them from coming back! There are two types of headaches: primary headaches and secondary headaches. Primary headaches are not associated with (caused by) other diseases. 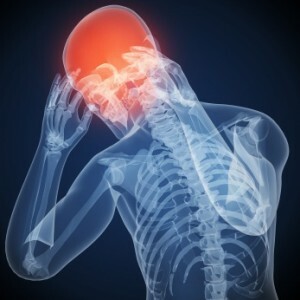 Examples of primary headaches are migraine headaches, tension headaches, and cluster headaches. Secondary headaches are caused by associated disease. The associated disease may be minor or serious and life threatening. Tension headaches are the most common type of headache that our patients present at North Adelaide Physiotherapy with. This is often related to pain and tension in the neck region. A disorder of the neck joints or the muscles that connect to the base of your scull (cervicogenic dyasfunctio) may refer pain into your head; this is because the nerves that are in your neck are also connected to your head and face. You have pain between your shoulder blades. What are the symptoms of Neck headaches? Neck headaches often begin in the back of the head and upper neck as a band-like tightness/ pressure/pain that can lead to reduced range of movement. Tension headaches also are described as a band of pressure encircling the head with the most intense pain over the eyebrows. The pain of tension headaches usually is mild (not disabling) and bilateral (affecting both sides of the head). Tension headaches are not associated with an aura (see below) and are seldom associated with nausea, vomiting, or sensitivity to light and sound. Tension headaches usually occur sporadically (infrequently and without a pattern) but can occur frequently and even daily in some people. Most people find that they are still able to function despite their tension headaches. North Adelaide Physiotherapy will be able to accurately assess and diagnose whether your neck is causing your headache. Your North Adelaide Physiotherapist will also provide postural and ergonomic advice if this is outlined to be a contributing factor. Implementation of a specialised neck pillow may also be provided as well as other preventative measures. A thorough examination using digital spinal analysis (posture pro) and XRays from your North Adelaide Physiotherapist will assist in identifying the real cause of your headaches so that a treatment can be found to stop your headaches from coming back! Isn’t it time to stop having your life limited by headaches? ?